Not even Bilal seems to buy what it’s selling. An account of the turbulent life of Bilal bin Rabah, who rose to political prominence in the Arabian Peninsula following a life in captivity as a slave, the film certainly weaves a tale of sought-after freedom that is broadly empowering for being among the first of its kind. The screenwriters (Alexander Kronemer, Michael Wolfe, Yassin Kamel, and director Khurram Alavi) populate the dialogue with dime-store clichés and inspiring declarations of equality, yet Alavi and co-director Ayman Jamal cannot be bothered to inject much urgency into the proceedings. Nearly everything is played as glum and drab. The contradiction is particularly notable in the backgrounds and establishing shots of what surrounds the characters, particularly in sequences of warfare (This, by the way, is not a film for children, boasting a fairly moderate-to-heavy PG-13 rating that it earns). The animation style utilizes slow-motion and quick-zoom photography, careful to pay close attention to the geography of the action. 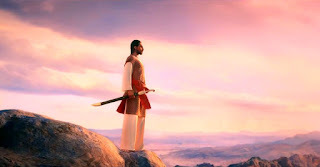 The climax of the film is a battle of appropriately epic scale, featuring fight choreography that must have been coordinated in reality before being rendered with the animated figures onscreen: An archer uses the stirrup of a horse’s saddle as a slingshot to gain momentum for a meticulously aimed shot, the sword fights are not mere swashbuckling feats but genuinely exhausting battles of will, and so forth. The action sequences are impressive, then, but also indicative of a problem: The existence of a beating heart here is in question. Outside the rousing combat, the film’s story consists of only the broad strokes of bin Rabah’s story, so that there isn’t much in the way of emotional engagement in the specific events. Perhaps that is by design, as the story itself is a fixture of the Islamic faith. Hagiography would go hand-in-hand with the priorities of a screenplay that structures the tale as a religious fable. There are few complications within this story, as told by the screenwriters, yet, as with any religious story, one can tell that the nuances are trying break free of rigid expectations. The Bilal of the film, voiced by Adewale Akinnuoye-Agbaje, still comes from a childhood of enslavement under the rule of Umayya bin Khalaf (voice of Ian McShane), a trader who acquired Bilal under brutally violent circumstances that culminated in the death of Bilal’s mother (voiced by Cynthia McWilliams). He proved himself an able fighter in scuffles with Safwan (voiced by Mick Wingert), Umayya’s snarling son and, in adulthood, rises to do battle with Umayya’s forces after aligning himself with a local Islamic leader, seeking freedom for himself and for his sister Ghufaira (also voiced by McWilliams). Until it puts its characters into action (which is almost exclusively at the end of this story), the pacing is sluggish, and the character designs have been rendered too imprecisely for the emotional beats to earn the necessary power behind them. The result is a strangely robotic telling of a tale that certainly had a lot of potential. Bilal struggles with the follow-through, offering only benign storytelling avenues, some broadly defined archetypes as characters, and a generic climax that solves everything in battle.